National Geographic Children's Books, 9781426310669, 176pp. Tired of having to contain your hidden urge to fart and finger-pick? Can't get enough of foul food and flies? Get ready to gross out all of your friends with these hysterically nauseating facts about all things gross and gruesome. Bringing together the slimiest, smelliest, and stickiest topics imaginable, That's Gross, is chock-full of foul facts that are guaranteed to make your stomach churn. Each chapter is packed with icky information, wacky and colorful pictures, and sickening sidebarsthat will make you say "That's Gross!" 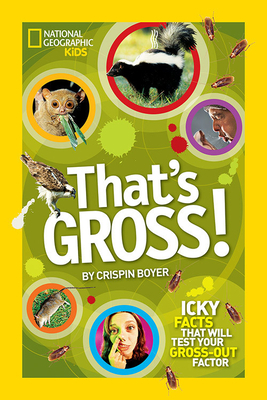 Hold on to your stomach while we explore the world of barf, bugs, boogers, and other things your parents won't like. CRISPIN BOYER is a frequent contributor to National Geographic Kids magazine. His books include National Geographic Kids Ultimate U.S. Road Trip Atlas, National Geographic Kids Everything Castles, and National Geographic Kids Everything Ancient Egypt.